Have an effective use of your meeting time using this employee self-analysis. Setting regular meetings with your call handlers is a best practice that every customer service manager (or whoever manages call handlers at your business) should follow. But what should you regularly be following up on? Well, you want to help your employees improve and become the best they can be, of course. While there has to be constructive feedback in these meetings, it helps to have both you as the leader as well as your employee(s) come to the meeting already prepared. That is why having an employee complete a self-assessment is important so that you can both discuss it during the meeting. First, have your employee listen to a few of their recorded phone calls before you meet. You can choose some calls for them ahead of time that you’d like them to assess, or let them choose. Make sure a variety of calls are included where the caller did or did not book an appointment. This way, both you and the employee can notice things that they do well and places for improvement. 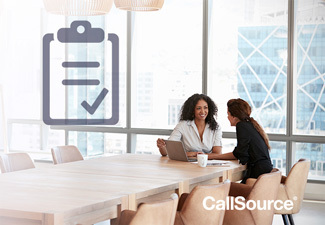 This process of choosing calls to listen to is even simpler if you are using a product like CallSource’s Telephone Performance Analysis Report, where call handler’s scored phone calls are easily accessible. Prior to the meeting, after choosing about two or three calls to use for the assessment, the employee should start evaluating their calls on a constructive level. You as the manager should do this as well so that once you meet up, you can compare notes and see if you agree or notice things that the other did not. Feel free to use an outline such as the one below when analyzing these calls. We also have a printable/editable version you can download to use here. Two successful phone habits noticed during the review? Two items we believe we can change/tweak over the phone? Action Plan: What specifically will you do to address the items above? Be sure that you and your employee have completed steps 1 and 2 before your scheduled meeting time. Then, once you are in your meeting, you can discuss the calls chosen and what each of you wrote on the evaluation. This is time for a constructive discussion – every comment should have a follow-up action item to go along with it, as outlined in the sheet. It is not helpful to simply say a call was “good” or “bad.” You need to go into further detail. Remember, this is a meeting to not only highlight your employee’s great work but to help them further their skills as well. Make sure to have these meetings regularly. They are a great check-in to make sure there is time set aside to meet with each employee – whether that be on a monthly, bi-monthly, or quarterly basis. You want to make sure these check-ins are more often than just the employee’s yearly evaluation. Use this call handler self-evaluation sheet to make sure that your employees are staying on top of their own improvement, and that you are regularly communicating with them on their efforts.